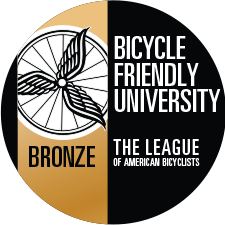 Bicycle Friendly University (BFU) is a program through the League of American Bicyclists that recognizes institutions of higher education for promoting and providing a more bikeable campus for students, staff, and visitors. The BFU program provides the roadmap and technical assistance to create great campuses for cycling. The University of Mississippi submitted its first BFU application in summer 2014. In October 2014, the University of Mississippi received honorable mention as a Bicycle Friendly University. Receiving this designation recognizes that the University is beginning to take the necessary steps to better meet the needs of cyclists. Since then, on November 5th, 2015, the University of Mississippi has been awarded the Bronze Award as a Bicycle Friendly University, which will continue to promote a more bike friendly campus and make biking a more accessible mode of transportation. Active Transportation Advisory Committee is responsible for keeping the university’s BFU status up to date by submitting an annual application. To learn more about the Bicycle Friendly University program, click here.